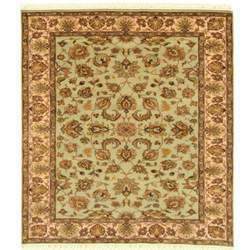 We are offering a wide range of Kashmiri Chain Stitch Rugs. Embroidery covers the whole surface (chain stitch). All kind of Rugs with best quality made by talented and expert weavers from Kashmir. Available in best price and offers. 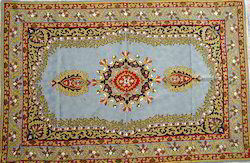 Chainstitch embroidered rugs, also available - cushion covers, curtains, tablecovers. These are all machine made rugs. Available in 6 design and 6 sizes. The name of Npc International is widely recognized as a dependable Manufacturer, Exporter & Supplier of Kashmiri Rugs. Our Imperial Kashmir Rug Collection is an exquisite collection of silk rugs that masterfully captures the opulence of the ancient Mogul designs and reflects grandeur that befits a royal court. A Kashmir Rug is a handmade, hand-knotted oriental rug, that origins from Kashmir. Kashmir rugs or carpets have beautiful, intricate designs that are primarily Oriental floral style and come in a range of colors, designs, sizes and qualities. There are numerous hand knotted woolen carpet producing centers in India but traditional hand knotted silk carpets in India can only be found in Kashmir. The origins of the traditional silk carpets of Kashmir can be traced to the Mughal period.